Emogene Marie Katzenberger passed away March 24, 2019 at the age of 90. 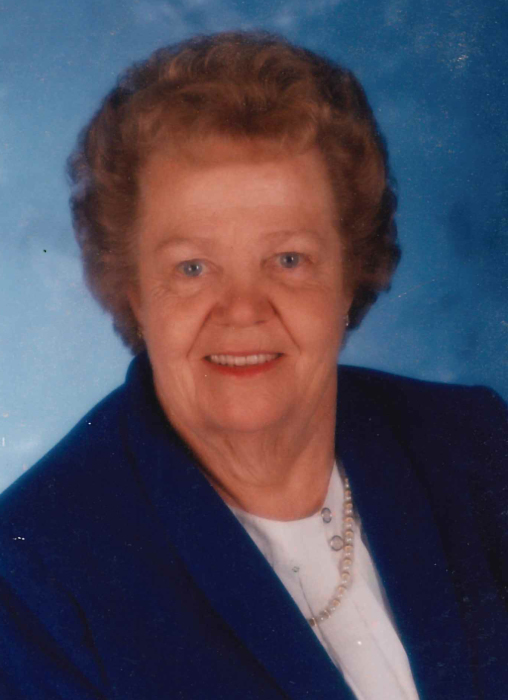 A Viewing will be held Thursday, March 28, 2019, from 7:00 – 8:00 PM, in the Rose Room Chapel at Croxford Funeral Home. Memorial Services will take place at 2:00 on Friday, March 29 in the Rose Room Chapel at Croxford Funeral Home. Emogene was born February 23, 1929 in Fort Benton, MT to Noel and Agnes Anderson. Emogene grew up on the family farm with her parents and three brothers, Noel, Bob and Evon. She attended school in a one-room school house and continued school in Fort Benton. It was there that she met and fell in love with Lee Katzenberger. Lee and Emogene were married December 15, 1944 before Lee left for the war. Upon his return, they started their family with the arrival of their daughter Linda. Lee and Emogene moved to the Bar Z Ranch at the base of the Highwood Mountains July 4, 1946. It was on the ranch that their three sons, Loren, Lyle and Lewis, joined the family. Lee and Emogene worked side by side to make their home and created a beautiful ranch with their blood, sweat and tears – a legacy they were very proud of. Emogene would work side by side with Lee in the cattle yard or the hay field but when it was time to go to town, she had to look her best. She would wear a suit, often one of her hand-made ultra-suede suits, with heels and her signature red lipstick! Emogene was active in her community; participating in the Women’s club, Eastern Star and 4-H. She was also very creative and enjoyed cooking, sewing, cross-stitch and beadwork. Her crafts and goodies were an expression of her love. She poured her heart and soul into her projects, wanting them to be perfect and wanting the recipient to know how much they meant to her. Lee and Emogene retired to Great Falls in 1992. They continued to stay active in their condo association and following Highwood’s sports teams. They were honored with the title of “Highwood Mountaineer Super Fans” which was very special to them. Lee and Emogene were quite the pair, joined at the hip, always together and so in love. When her health started to fail, Lee never left her side. When Lee passed, Emy was never quite the same. We know they are together now, dancing again. Emogene was preceded in death by her husband, Lee; son, Lewis, son-in-law, Ken; brothers, Bob and Noel. Emogene is survived by daughter, Linda Knoche; sons, Loren (Sheryl) and Lyle Katzenberger; brother, Evon (Bev) Anderson; 5 grandchildren; 6 great-grandchildren.